The reappearance on the art market of the sculpted group representing Charity, by Jean Van Delen which can be dated to around 1675, from the Tour et Taxis chapel (Church of Notre Dame du Sablon) in Brussels, and its return to Belgium thanks to help from the Fondation Roi Baudouin have been aptly commended (see news item of 6/7/12). This magnificent sculpture known only through a description so beautiful that it led many to its regret its loss , should soon find itself back at its original home. We should of course rejoice at this positive event for national heritage. However, this is unfortunately only a passing moment in a very different reality overshadowed partly by a more permanent set of circumstances : we are referring to the situation now prevailing in the major federal cultural institutions located in Brussels and the threats they face. We will return to the subject in another article. In the meantime, let us take a closer look at the particular case of the exceptional sculpture collection owned by the Musees Royaux des Beaux-Arts. with original typos and spelling error. Let us first briefly place the question in context, that is the scandal corresponding to the inaccessibility of an enormous part of the artistic heritage managed by the Musees. The rooms devoted to 15th and 16th century painting have been closed for over ten years due to the presence of asbestos (which we do not doubt) and, also they say, because of renovation work (this has yet to be proven - ill. 1). The result is that a selection of works from these collections is hanging in other rooms, thus depriving other paintings, notably 17and 18th century works, from being exhibited. Over the years, we have come to understand that what was initially a temporary situation has now become permanent. 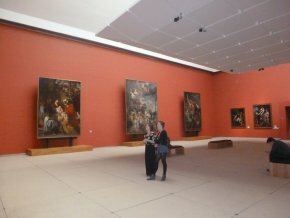 As for the premises where the marvellous Rubens sketches owned by the Musees were presented, they were closed during the summer of 2010 with no announcement of any reopening date. It would appear, but with no further details, that conservation conditions there are no longer satisfactory ; we feel justified in concluding that nothing much is being done there either to remedy the situation. 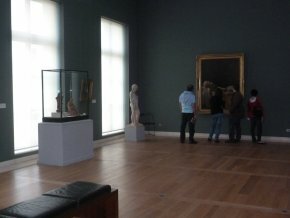 Finally, in February 2011, the entire Musee d’Art Moderne was closed down by the general management without even bothering, again, to indicate a possible reopening . 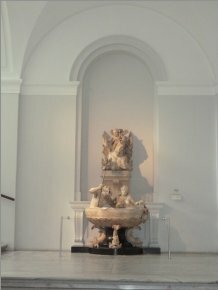 This lack of consideration for the public is appalling and in fact reveals a more deep-rooted malaise since the management, by acting in this way, is shamelessly demonstrating its own indifference for all these rich pages of art history which it is throwing away with no concern for ever recovering them. 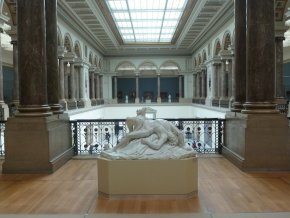 When looking at the overall management of the collections at the Musees royaux des Beaux-Arts, the outlook is bleak indeed and even more so in the case of the magnificent sculpture collection there. Sculpture is one of the most salient manifestations of art history in Belgium ; this artistic domain is comparable in quality with that of France and Italy, no small feat. And the Musees royaux des Beaux-Arts holds the world’s most extensive ensemble of sculptures from the territories corresponding to present-day Belgium over a period ranging from the 17th century until now. But these heritage treasures, including Baroque and Neo-Classical terracotta masterpieces, the period we will be studying here , is mostly stored away in dust-covered facilities, at times in poor conservation conditions. Must we add that the publications of the institution’s scholars have been practically nonexistent for decades ? We are mortified to have to write that the last catalogue for the old master sculpture collections at the Musees, by Marguerite Devigne, which is extremely useful but summary and obviously outdated, came out in...1923. For artists born between 1750 and 1882, we had to wait until 1992 to finally welcome an excellent catalogue, thanks mainly to the perseveration and enthusiasm of Jacques Van Lennep who has since retired. As concerns the Baroque period today, following the departure of Helene Bussers (undoubtedly responsible for the department’s recent beautiful acquisitions  - ill. 2), the current organization chart does not provide for a specific person to take over this section (in any case no one fills the position today) and the acting curators (now in limited numbers) are already overloaded with the work they have in the painting department. 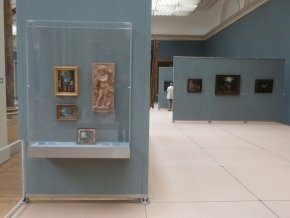 We should no doubt see this lack of visibility at the Musees royaux des Beaux-Arts as the reason for not placing the spectacular Van Herck collection, acquired by the Fondation Roi Baudouin, on deposit in Brussels in 2000. Heaven knows that, along with the existing collections, it would have enabled the Musees to consolidate an already exceptional ensemble even further and definitively establish their reputation in this field. However, the Van Herck collection was deposited almost entirely at the Museum in Antwerp...where it is still awaiting a permanent presentation ! It would seem that lacking scholarly criteria, Foundation officials resorted to the geographical origins of many of the artists in choosing Antwerp. 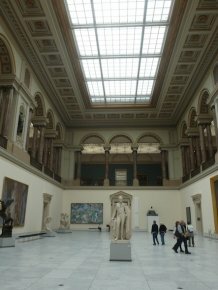 Clearly, as should have been the case, if the Musees royaux des Beaux-Arts in Brussels had been known for their active commitment to the conservation and study of sculpture, the Van Herck collections would have been sent to this institution. This unique opportunity was passed up due to mismanagement of the collections. Nevertheless, if we look back at the Musees royaux des Beaux-Arts and its focus on the sculpture holdings, due to the initiative of its director (at the time Philippe Roberts-Jones), and the competence of the scholars then, we can attribute a major event to their endeavors, held in 1977 when they staged, in collaboration with the Musees royaux d’Art et d’Histoire (also known by a more familiar name as Musees du Cinquantenaire), an exhibition entitled La sculpture au siecle de Rubens dans les Pays-Bas meridionaux et la principaute de Liege. The catalogue, with brief but generally well-documented entries, is considered an excellent publication for the time. It contained a particularly well developed systematic bibliography of considerable scholarly value. We should note that the 1977 exhibition was staged more or less at the time when the Musees royaux des Beaux-Arts were undergoing a complete refurbishment, an extensive project resulting in the institution’s current form . This means they are now showing their wear. Freshening up the paint in one or another of the galleries is not enough (ill. 3). But this is not what we wished to dwell on : we must point out the commendable decision made then to scatter a selection of sculptures throughout the rooms, essentially marbles rather than terracottas (with a few bronzes in the Musees’ modern section). The very pleasant layout blending paintings and various sculptures can still be appreciated today despite the rooms’ rather worn aspect (ill. 2,4,7). Besides offering a better understanding of the period, the presence of statues, groups and also busts also attenuates the feeling of emptiness and coldness in certain galleries (ill. 3), the large central hall (ill. 5), hallways, staircases (ill. 6), etc. 6. Fountain with Sea Gods by Grupello. The success of the 1977 exhibition and its catalog, along with the general reorganization of the rooms in which the marbles and terracottas had found a beautiful home, might have been followed by many more felicitous events, and the study of sculpture in the southern Low Countries should have received a major impulse. But, with the exception of just a few dissertations and monographs, research remained relatively unexplored by university scholars. The Musees des Beaux-Arts decided to lay back on their laurels, letting the collection go dormant once they had selected the works to be placed in the renovated rooms. However, there was one magnificent incident (benefiting mainly the 19th century collections) when the Musees woke from their slumber, thanks once more to the determination of Philippe Roberts-Jones and the energy of J. Van Lennep, in order to bring a hundred Neo-Classical and Romantic sculptures from storage placing them in a special section in 1992. Alas, for some obscure reason it was soon closed and the works sent back to the cellars. There was no attempt to at least move some of the showcases around in order to fill up the Neo-Classical room which houses David’s famous Marat Assassine (ill. 7). For example, the management might have thought about presenting the very beautiful terracotta bozzetti by the talented Gilles Lambert Godecharle, preparatory for the ornamental front of the Palais du Conseil de Brabant, the current Palais de la Nation (see for example here). These are works of remarkable quality which no one has seen since they were presented at the Musee communal in Ixelles during the exhibition on Neo-Classicism in Belgium organized there in 1985. At the time, they had also unearthed from storage (with probably much dusting off !) some unexpected rough studies in plaster and clay by Mathieu Kessels, technically and spiritually carved (see here for example), which immediately returned to the museum cellars as soon as the exhibition closed . The major exhibition held in 1977 assembled mostly pieces from the holdings of the organizing museums. The first, with the most extensive number, was the Musees royaux des Beaux-Arts ; the collections of the Cinquantenaire being more limited. To this, a few works astutely selected from public and private collections were also added. The period under focus covered only the 17th century, although the career of some artists went beyond 1700. In this year dedicated to celebrating Rubens, such a chronological restriction was understandable, despite the risk of reinforcing an already widespread cliche by which the 18th century was less interesting, or yet another, that of sending a message to the public implying that the Musees terracotta collections were limited to this Rubens century. And yet these holdings include a great number of works attesting to the very high level of quality maintained by sculpture studios after the turn of the century, continuously responding with great panache over several decades to the multiple and very demanding commissions of the Church. The recent exhibition Le baroque devoile. Nouveau regard sur la sculpture a Bruxelles et en Belgique (see article in French) to which the Musees royaux lent only a restricted number of works, was a fine demonstration of this beautiful vitality . The Musees’ reluctance to collaborate in this exhibition is unfortunate for more than one reason, since this was a perfect occasion to remind the public - at little expense - as was the organizers’ intention, of their magnificent but practically unknown sculpture collection. Furthermore, they could have benefited (free of charge) from a scholarly study of their holdings thanks to the catalogue entries which could contribute important information and commentaries, adding to a better knowledge and understanding of the exhibited works. What this means is that the pieces from the Musees royaux, even the best known and previously published, are still awaiting the thorough study they deserve. Much can be said about most of these works, with little effort. In other words, creating a scholarly position here would be far from superfluous. A budgeted program for studies, restorations, pedagogical and presentation enhancement, not to mention of course acquisitions  is needed given the exceptional importance of this ensemble which joined the collections almost accidentally in the 19th century (and extended later by only a few purchases). The creation of a center for sculpture studies in the southern Low Countries and the Principality of Liege (although the collections do not hold any Liege works yet) is also entirely justified. At the same time, it would be natural for the Cinquantenaire, whose collections of 15th and 16th century sculptures are particularly rich, to be acknowledged as the ideal place to approach this period. The major difference between the two is that the works at Cinquantenaire are remarkably exhibited since the refurbishment carried out in 2000 and have a, partial, catalogue , while at the Musees royaux des Beaux-Arts the 17th and 18th century sculptures are generally left uncared for and much needs to be done. Although they are part of a perfectly coherent ensemble and their partial presentation today, mixed in with paintings, is a successful move which should be maintained at all costs, more should be done to encourage a dynamic project for them perhaps in the way of a collaboration between the Fondation Roi Baudouin and the current trustees (the Musee des Beaux-Arts in Antwerp), to join the Van Herck collection and the one at the Musees royaux. This merger, along with the creation of a studies center such as we described above, would give rise to an exceptional cultural site, a unique example in the art world. 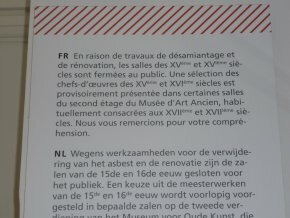 At a time when the future of Belgian federal scholarly institutions - and this includes the Musees royaux in Brussels - are about to undergo a radical reorganization (to be the subject of our next article), we would like to send out a solemn appeal today in favor of the sculpture collections which, as we have described here, elicit little or no interest. We hope this article will draw the attention of the current director general of the Musees royaux des Beaux-Arts. Also, may the responsible authorities, in the person of the Minister Paul Magnette, hear our cry for help and have his collaborators study ways to act on it in a positive manner. The public as well as the international community of art historians would be immensely grateful. There is no need to wait any longer. We would like to make a wish, which could be easily carried out tomorrow at little cost : that more terracottas be installed in the galleries at least. This would be an important symbolic gesture to begin with. It could be accompanied by an encouraging announcement concerning the rest of the collections. We suggest starting the operation with the works of Godecharle and Kessels which we already mentioned. Or better still (though one does not exclude the other !) return the spectacular project by Mathieu Van Beveren for the monument in memory of Lamoral de Tour et Taxis, preparatory for the monument produced in 1678 in black and white marble in the family funerary chapel in the church of Notre Dame du Sablon we discussed at the beginning of this article. This modello in three parts had been presented in the exhibition Le baroque devoile. Although it was returned to the Musees in September 2011, it has still not been placed in its spot. We must say that it was in the rooms where visitors are supposed to admire Rubens’ sketches. As we know, the section has been inaccessible (ill. 8) since 2010 "given the persistent poor climatic conditions" [sic]. See M. F. D. Goethals, Histoire des lettres, des sciences et des arts en Belgique et dans les pays limitrophes, III, Bruxelles, 1842, p. 247 : "[Charity]is of beautiful character : thought, execution, everything in it deserves to be praised ; the ensemble is admirable and the details are interesting ; the expression is true, it is that of nature itself", quoted by P. Philippot, D. Coekelberghs, P. Loze and D. Vautier, L’architecture religieuse et la sculpture baroques dans les Pays-Bas meridionaux et la principaute de Liege, Ed. Mardaga, Sprimont, 2003, p. 945. In order to make up for this, but again to the detriment of other works, a selection (pretentitously entitled "The Curators’ Choice") of modern paintings and sculptures is presented on a rotating basis in the middle of the old master hang. Surprisingly, an exhibition highlighting Constantin Meunier (whose hundredth anniversary of his death had been forgotten in 2005) has been announced at the end of this year. We await it with a high deal of interest and much curiosity. The case of the artist’s house and the relative accessibility of its collections, here again, managed also by the Musees royaux, deserves attention as well. We refer to the large marble by Jacques Berge representing A Wounded Gladiator (1735) acquired just before 1980, as well as the very beautiful Seated Virgin with Child, a terracotta by Jean Cardon (1643) which joined the collections at the Musees royaux a few years later. The renovated rooms were inaugurated in October 1985 after a long construction period. The history of "modern" sculpture collections was described in detail by J. Van Lennep in his remarkable Catalogue de la sculpture. Artistes nes entre 1750 et 1882, La collection. Deux siecles d’histoire, Musee royaux des Beaux-Arts de Belgique, 1992, pp. 39-106. There is no comparable study for Baroque works. We enjoyed seeing some of them again at the exhibition staged by Willem Berge, Heimwee naar de Klassieken. De beelden van Mathieu Kessels en zijn tijdgenoten (1815-1840), Bois-le-Ducm 1994. They had reappeared briefly in the temporary sculpture gallery set up in 1992 by Van Lennep as recounted above. Held at almost the same time, the exhibition Fascination baroque. La sculpture baroque flamande dans les collections publique francaises (see article in French), Musee de Flandre, Cassel, 2011, also contributed its share of new information and thoughts on the subject. Unless we are mistaken, the Liege sculptors, including the great Jean Delcour, are not represented in the collections of the Musees royaux des Beaux-Arts. A gap which surely needs to be filled ! 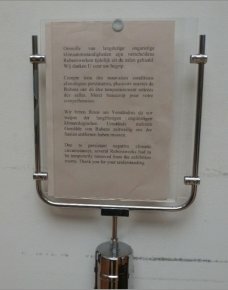 A selection of 150 pieces was included in a fine publication under the supervision of Antoinette Huysmans, La sculpture des Pays-Bas meridionaux et de la principaute de Liege. XVe et XVIe siecles, Brussels, 2000, published at the time of the inauguration of the new presentation for the sculptures.